In a HARDtalk programme broadcast on November 26 Stephen Sackur talks to the foreign affairs minister of Botswana, Phandu Skelemani. Robert Mugabe says that Africa's problems must be solved by Africans and indeed, his country, Zimbabwe, has plenty of problems. But are Zimbabwe's neighbours willing or able to make a decisive intervention, given their unwillingness to take on Mugabe himself? 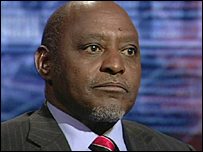 Stephen Sackur talks to Phandu Skelemani, the foreign minister of Botswana. His government is one of the few prepared to be critical of Zimbabwe's president. Why is confronting Mugabe a taboo in southern Africa? HARDtalk is broadcast on the BBC World News channel Monday to Thursday at the following times; 0430, 0930, 1430, 1830 (Middle East and South Asia only), 2130 and 2330 (except in the Asia Pacific region). HARDtalk is also broadcast on the BBC News channel at 0430 and 2330.